Saying that Russia has been in the news for espionage and hacking, etc. is like saying there’s oxygen in the air – it seems we breathe that news. Despite whatever Russian hackers have done, people get so hung up on the marketing value of the Russia brand that they forget there was supposed to be a story too. 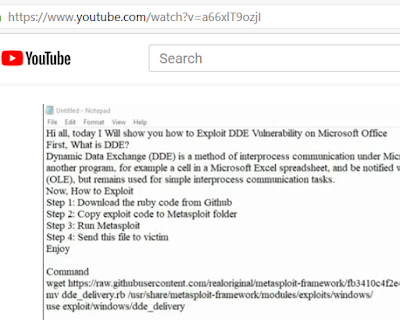 The exploitation of DDE is an example. There are many articles about Russian hackers exploiting the terrorist attack in New York in order to lure people into opening documents that are booby-trapped with DDE content. There are two real stories here and Russian hackers are not one of them. We have a story involving confidence attacks and another story about DDE exploitation. If, like Jan, you prefer to use a kit, Metasploit has a module all set up for you. Russian hackers using exploits to deliver malware is not a story. Using a tragedy as a lure is not a story. Anyone involved in security already knew that exploitation the terrorist attack story would be happening within minutes. If you are going to use the Russian brand for marketing (like I am now), use the marketing for good. In that spirit I would like to provide at least a little prescriptive guidance. Many security companies have excellent write-ups of the actual threat, how it works, what Yara rules and Snort signatures may be available, and other truly relevant information. Read those articles if security is your thing. Read my blog if it isn’t . Perhaps you can employ Microsoft’s mitigation strategies, but whether you can or cannot, remember that blocking these attacks is part of a strategy, not the goal. Protecting data is the goal. There are books, courses, and I believe even theologies that deal with data protection, but “how to” is beyond the scope of this blog and outside of my area of practice. Cutting through the haze of hype is the story I want to tell. If you are keeping your eye on the ball, the DDE vulnerability is a reminder that protecting your data is the endgame. If your data is vulnerable to exploitation of DDE, perhaps DDE is not your biggest problem. The DDE issue might also be a reminder to audit/test your defense systems. Thanks Greg, for the reminder to keep my eye on the ball. You see… sometimes it isn’t all about Russia, but it just might be about tennis lessons with from Anna Kournikova. Anna’s story is timeless and I think that Anna is too - she is just as beautiful as she was 16 years ago when a worm by her namesake made the world news. In the blog "Internal Audits, Lawsuits, ad Love Letters, I promised a blog dealing with the Malware aspect of using public computers. You can find that blog on the Quttera blog at Public Computers and Malware.